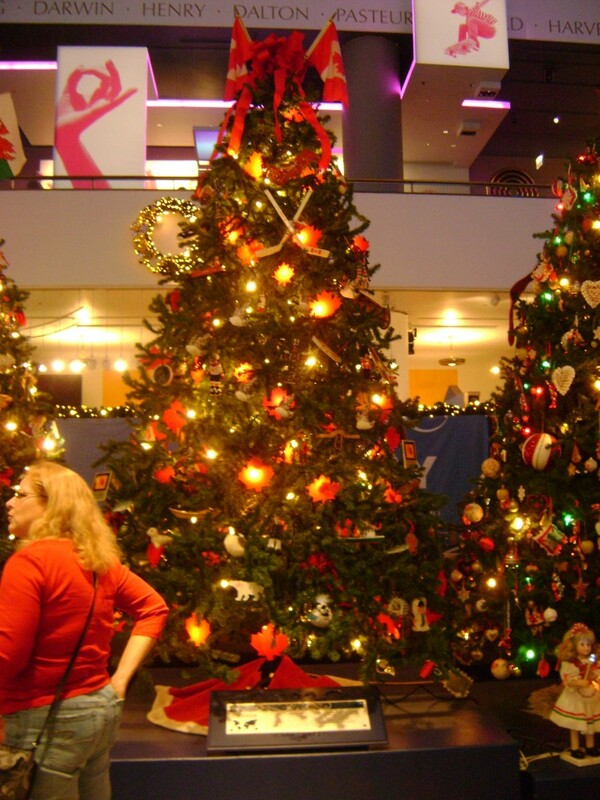 If the Cook County Treasurer’s display of “Christmas Trees Around the World” wasn’t enough, the Chicago Museum of Science and Industry likewise has a display of “Christmas Trees Around the World”. 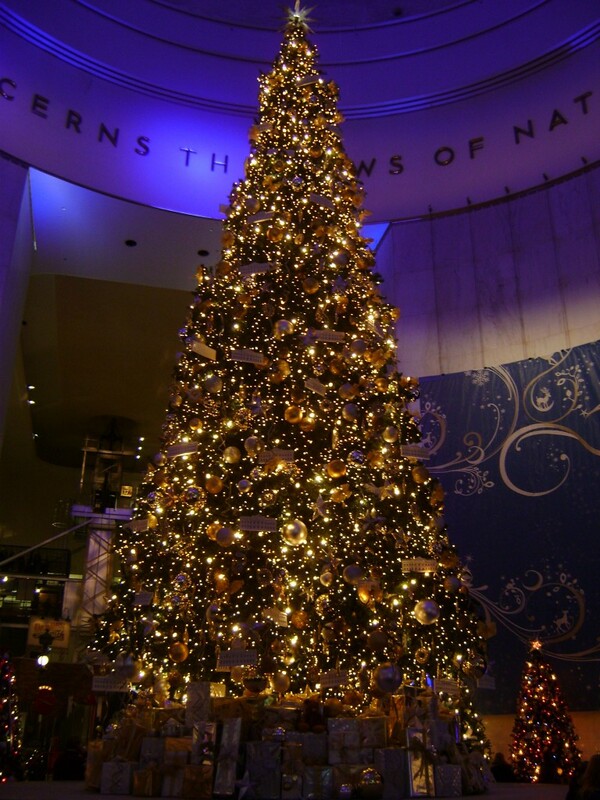 Unlike the Treasurer’s Office which has table top height trees, the Museum’s trees are full height – well, as full height as one could imagine artificial trees. I gather that they’re more sustainable, and they do make for quite an impressive display. 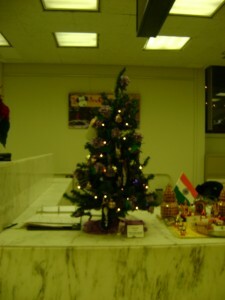 The Canadian tree was decorated by the Canadian Women’s Club, as was the tree at the Treasurer’s Office. 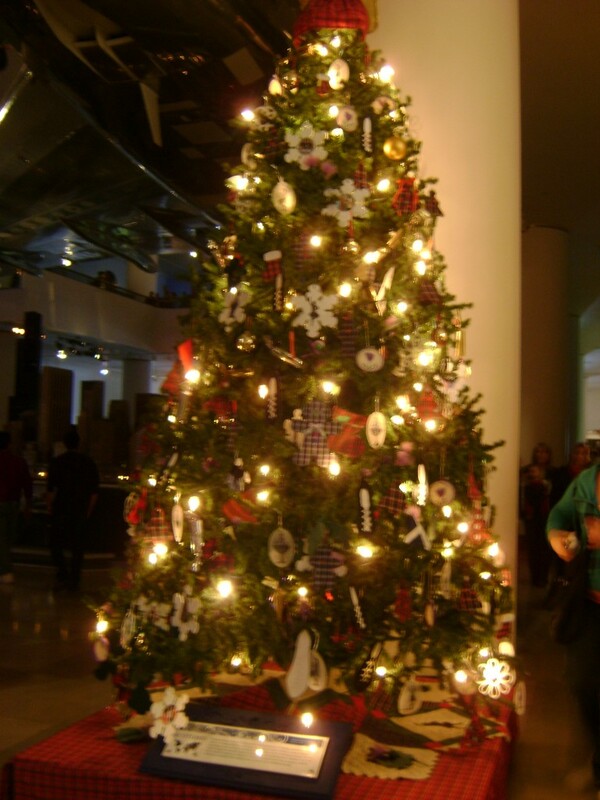 Because the Museum’s tree is much larger, the Canadian Women’s Club used their larger ornaments on this tree, rather than drowning the smaller tree at the Treasurer’s Office in big ornaments. One can only hope that the dolly decorator programs on cable television understand this concept, rather than attempting to inflict oversized ornaments on tiny trees on society as their promotion of a new tasteful norm. The Scottish tree likewise was decorated by the Thistle and Heather Highland Dancers, who also did the Scottish tree at the Treasurer’s Office. Something about the Scottish trees though, I can never take a photograph of them without the image being wildly out of focus. The main tree at the Museum of Science and Industry was bedecked in simple, white lights this year; that in deference to the Museum’s current exhibit of the White House miniature. Chicago is a city of neighbourhoods, and a city of many ethnic backgrounds and traditions. Recently, I was invited to attend the Cook County Treasurer’s / Office of Ethnic Affairs Christmas Party of “Christmas Trees Around the World”. Every year, they send me an invite to attend. They know me from the Canadian Club and from the Saint Andrew Society, am never sure what to dress up as. 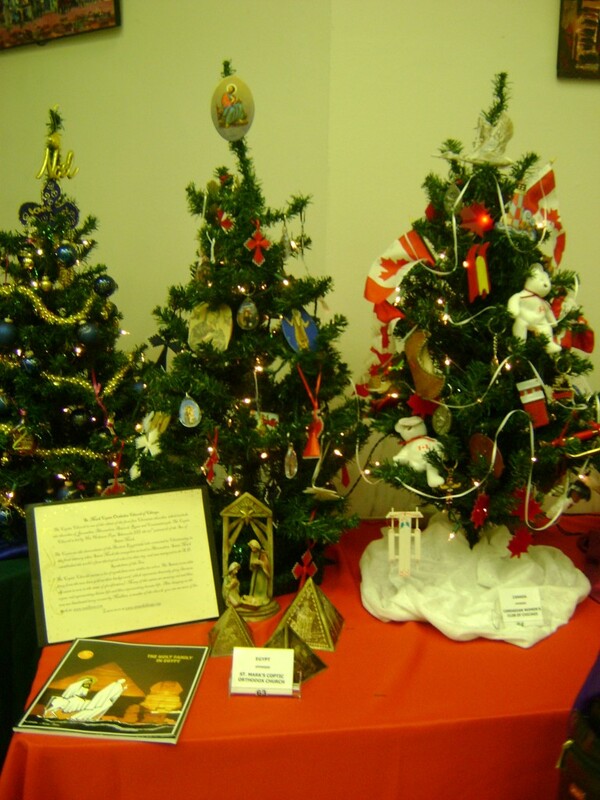 This event coincides with a display of Christmas trees decorated by various ethnic groups in the area, all on display in the same room where one pays property taxes at City Hall. A Hammond Organ, an Accordion - what more could a Christmas party need? 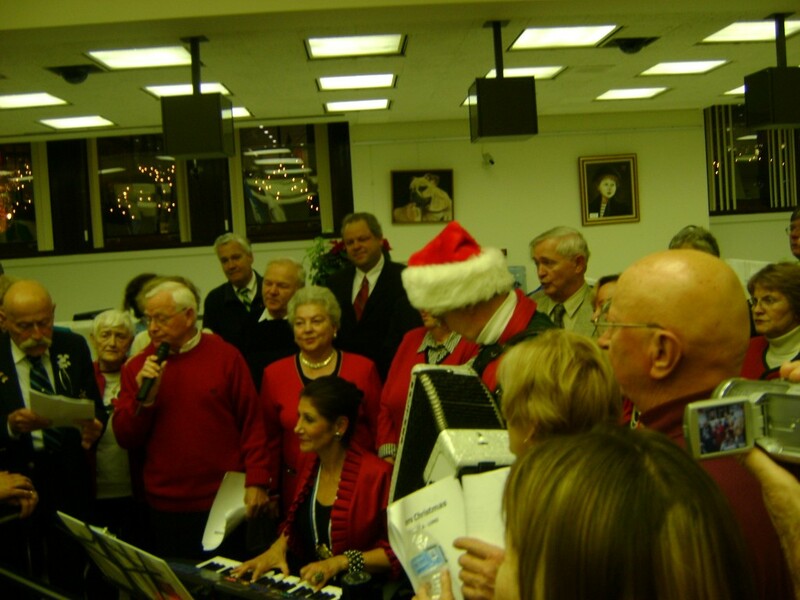 Last year, the County Treasurer could been seen crooning Christmas carols with the Chairman of the County Board, while the Chairman played a mean Hammond organ. This year, the Chair wasn’t in attendance, but the image from last year made me think that all that was missing was someone playing the accordion, like the parade scene in “Ferris Buehler’s Day Off”. Low and behold, this year –perhaps to make up for the non-appearance of the County Chair – the German American Association of Chicago supplied a rotund fellow with an accordion, leading the crowd in an all German rendition of “Silent Night”. The County Treasurer was positioned at the Hammond organ, though not nearly as theatrical as was the County Chair. It was a very Chicago sort of thing. Now about what to show up as: in panning both Canadian and Scottish organizations to see who would be making an appearance, the Canadian Club were planning a good showing, the Scots were lacking, so I dressed up in full highland garb. The Canadians were impressed. A lady from a Scandinavian consulate likewise appeared to be impressed though I may never know, as she only spoke to me in a language that I couldn’t understand. She did seem to be chuckling as she spoke, however. On that note however, and in response to the Germanic rendition of “Silent Night”, I attempted to get a French rendition of “Jingle Bells”, or rather “Vive la Vente” without success. They only others in attendance who could speak French were a group of people from Cameroon, and I think that the whole “snow” concept may have been a bit of a novelty. A recent editorial cartoon depicted Illinois as an airport. In the departures gate were the 2016 Olympic Games, a variety of major trade shows that recently announced leaving Chicago, and Oprah Winfrey. In the arrivals gate were prisoners being transferred from Gitmo. Much of this is directed at Chicago specifically: the “departures” noted are all from the city of Chicago, while the “arrival” denotes a town downstate. Throughout mankind, cities have come and gone. Only a few – Rome and Athens come to mind – have endured the Millennia. Now I’m not advocating a viewpoint that Chicago has completely folded and turned into a pile of ashes, far from it. As for this economic doldrum – maybe it can resurrect from the “ashes”? Let’s take a look…. This is a vibrant – dare I say global – city. Chicago is located in a commanding geographical position that as long as North America is populated, it will never go away. 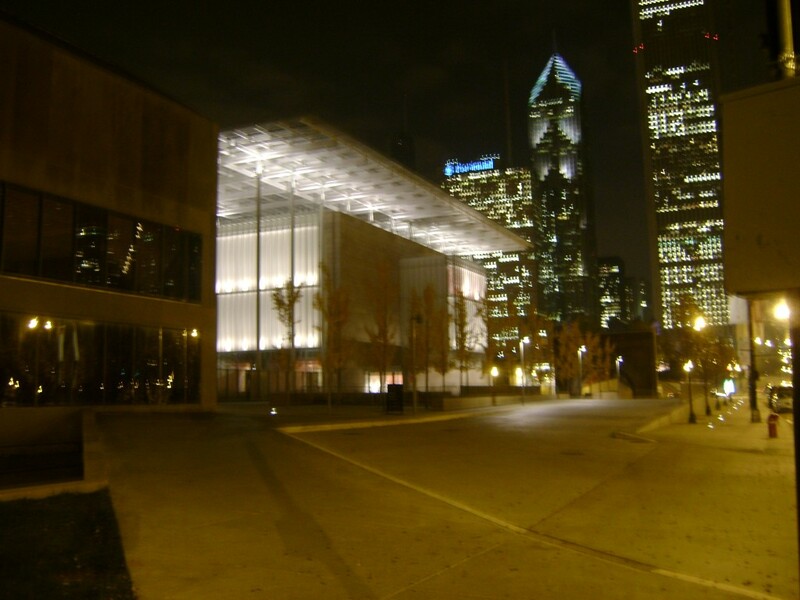 However, I’ve always thought of Chicago as being the epitome of the twentieth century – the early twentieth century. It embodied the Industrial Revolution in the United States: its economy was a product of mechanized industry. Yes, Chicago’s industry produced machines which created a sizeable market in itself. Chicago’s machines cultivated an agricultural industry which was brought to the city’s markets by machines produced in Chicago. The city’s physical layout – the skyscrapers and garden city suburbs fed by transportation devices – were shaped by machines. The transportation devices brought people to Chicago; it became a crossroads of the world – a title that still holds true today. Machines and industry brought people in Chicago together to socialize and do business – it became an organism of interurbanity. The latter part of the nineteenth century put the foundations in place for the twentieth century. Chicago’s economy truly made it the epitome of a twentieth century city. For the first half, anyway. To zero in on the garden city suburb reveals a clue as to what happened in the latter twentieth century. The garden city suburb worked best when people moved back and forth between city and suburb by mass transit. When the automobile supplanted mass transit, people didn’t socialize as they once did. Further, by that time, GI’s returning from the Second World War had been exposed to warmer climes with beaches. Those returning GI’s migrated to and established homes in places like… the Los Angeles Basin. So, Los Angeles – built around freeways that serviced suburbs and all of the same kinds of inventions that built Chicago in addition to a new industry of motion picture entertainment – came to be one endless suburb. Decidely individual, built to control and even limit social interaction. Not what the garden city suburb had intended, but then, the garden city suburb never realized the extent of proliferation of individual motorcars. So Chicago became old hat. All at once. Chicago was left to be an absolutely fabulous living museum of the early twentieth century. Los Angeles eventually outgrew its own makings as well. For quite some time, I was quite determined to believe that the prototypical US city of the twenty-first century was going to be Las Vegas – completely manmade and artificial; exceptionally self indulgent to boot. The current real estate bust may not support the notion of Las Vegas becoming much more than an overgrown gambling and retirement mecca. Which brings us back to Chicago. It has the infrastructure to pick up where it left off and grow back. One may even compare Chicago to Detroit, a city that has become a “doughnut” with very little left in its core. Detroit has left behind some fabulous ruins in its wake. The “Roundhouses of the World” exhibit that has been on display at the Hanna Public Library is closing this week. In a way, it still lives on. The Oak Park Architectural League is having its Bi-Annual Members Show this month at the Oak Park Public Library in Oak Park, Illinois. Being a member, my contribution to the OPAL exhibition is a condensed version of the “Roundhouses of the World” exhibit. This exhibit depicts a bit of the work to date associated with the Hanna Roundhouse. Using Prince Phillip’s musing of the studio cottages of the Banff Centre of the Arts “I gather that it’s my duty to declare this facility much more open than it previously has been”; although the OPAL exhibition is currently open to the public, the grand opening, if you will, will be held on Wednesday, December 9 at 630PM. I have been asked to say a couple words about the Hanna Roundhouse. The Oak Park Architectural League exhibit will remain on display in the Art Gallery of the library until December 29. It seemed like a simple enough request – appear with my daughter on a float in the North Michigan Avenue “Festival of Lights Parade”. North Michigan Avenue is the most exclusive shopping district in Chicago and to start the Christmas holiday shopping season, they have a large night time parade – bathed profusely in brilliant light. Sponsored by a variety of organizations including Disney and the Harris Bank it was well organized and professionally staged. 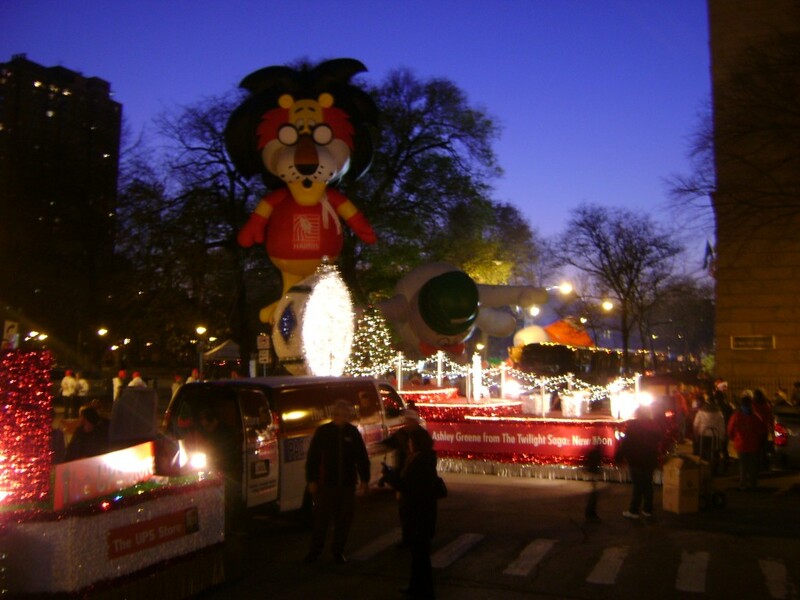 Our float, sponsored by the Museum of Science and Industry commemorating their “Christmas Around the World” display, was staged next to the Newberry Library under and archway of searchlights rotating about the sky. The float was kind of reminiscent of the “beauty parlour” scene in “Grease”, with ladies cascading symmetrically up vertical tiers to a proscenium – the ladies in this instance being girls from the Thistle and Heather Highland Dancers, their fathers strategically stationed onboard. We proceeded down Oak Street before the official parade start on Michigan Avenue – the storekeepers at Prada and Coach seemed impressed with our float. Spectators from the Dining Room at the Women’s Athletic Club to the window offices at Illinois Center were all watching and waving, and we waved back at them. We even passed by the spot where Oprah Winfrey filmed her TV show on the day when Michigan Avenue was closed; we could not find evidence of any pilgrims paying homage or erecting shrines to commemorate that event, though one would imagine that there still is time for this to occur. On a dark night under bright lights with cheering audiences, it was a festive experience for all of us onboard. It kind of seemed like the parade scene from “Ferris Beuhler’s Day Off” albeit North Michigan instead of Dearborn Street, and sun down instead of noon hour, but hey… You know, this is Chicago, and stuff like this seems to happen all the time. Now about Ferris Buehler – the house that was portrayed as a garage that housed the infamous Ferrari Daytona (a fiberglass replica) that slipped out of a window and down a hillside is up for sale. In real life, it is a house and was designed by a student of Mies van der Rohe. Its asking price is $2.3million. For me, I’m just fine with the Ferris Buehler parade experience instead. A recent presentation by the President of CEO’s for Cities to the Association of Architecture Organizations spoke of major trends affecting cities, and described scenarios for growing – and shrinking – cities. The concept of shrinking cities struck a particular note. Anyone familiar with the United States will immediately think of Detroit or a variety of cities across Michigan, Ohio, and perhaps upstate New York. These are cities that relied on a strong manufacturing economy as a basis for municipal growth, a manufacturing economy since vanished. For me; I’m drawn to rattle off any of several small towns that may have been founded on transportation and commerce systems that have since focused on being “more efficient”, concentrating on fewer, yet larger distribution centres. The Small Town Design Center at Mississippi State University has done excellent research and tangible project work on the shrinking small town issue. In smaller economies – like small towns – a simple change of stores on Main Street or realignment of a highway has a proportionally greater impact than it would on a larger economy. Small towns are particularly sensitive to shrinkage. Overall; how does a shrinking city get its residents to invest in buying a house when there may be so many abandoned properties around town? How does a shrinking city encourage new business to take root when so many other businesses – and the potentially “synchronicity” that occurs when businesses network and interact with other businesses – have disappeared? How can a shrinking city retain and develop quality services like schools, and develop opportunities to retain that prime demographic group of 18 – 34 year olds whom can build a lasting economy? The message was to discourage those cities from taking on municipal debt to finance potential growth, as that debt would become impossible to retire on shrinking revenues. Municipal debt would become detrimental to attracting business and providing services. Another comment struck a note, and was foreshadowed in previous postings herein: cities have strayed from providing quality public services – schools, libraries, recreation, entertainment and the like. Instead, people are seeking these services from commercial sources (bookstores rather than libraries) or themselves (home gyms and media rooms rather than public parks and cinemas). It was part of the “McMansion” and “Cocooning” phase that we’ve been through, which one may hope is behind us. The message for shrinking cities was to maintain quality municipal services, while holding the line on taxes as a way of attracting the influential “young” population. A recent news report from the Council on Tall Buildings and Urban Habitat cites fifty major, tall building projects worldwide that have been halted by a global economic downturn. 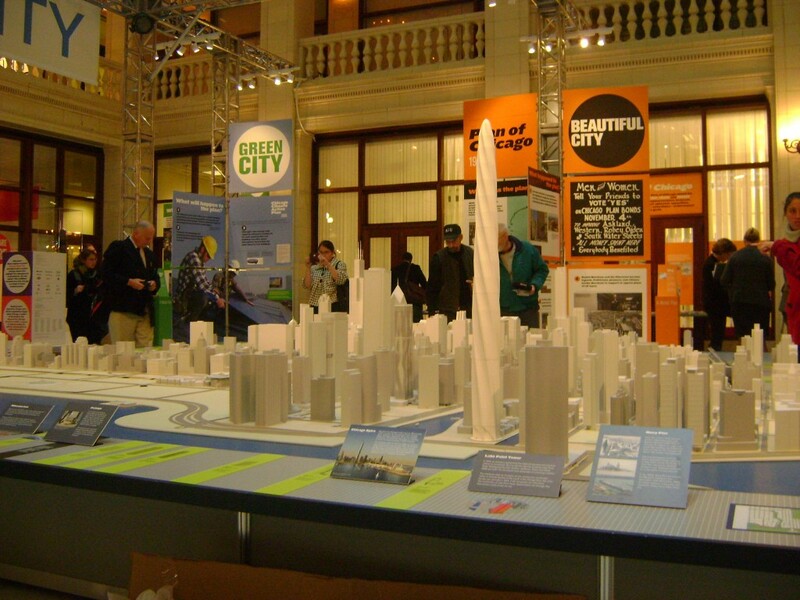 Last Friday, the Chicago Architecture Foundation’s “Chicago Model City” exhibit temporarily included the scale model of Santiago Calatrava’s “Spire” condominium project, the real one being on indefinite hold. Asides from the model representation, the only physical evidence this project has left in Chicago is a large, circular foundation, commonly referred to as the “bathtub”. Had the actual project been built, it would have been much taller than anything else in Chicago, including the Willis (nee Sears) Tower. Guess which building is the Spire? Towards the end of his career, Louis Sullivan (famous architect, reputed “Father of the Skyscraper” in some circles) had little work going through his practice. He had fallen on tough times. Reputedly, he used to “snooze” on this sofa at the Cliff Dwellers between lodging. 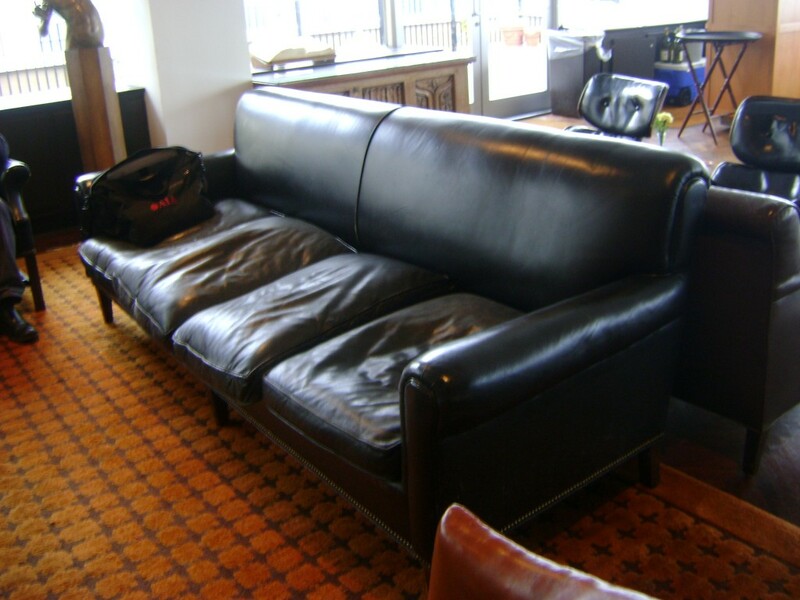 I doubt that the sofa that been restuffed or reupholstered during the interim; I’d gather that it has been cleaned…. This is an image that’s been missing from my presentations for quite some time. Suddenly, my interest in the abandoned railway roundhouse in Hanna, Alberta and electronic social media meet. Kind of. I’m helping the effort to restore the Hanna Roundhouse by donating a slideshow exhibit production describing the history roundhouses. It’s all being produced through a part of my practice called Babuk Presentations, or for the 21st Century, www.learnaboutchicago.com . This exhibit will be on display in the Hanna Public Library for the month of November. Babuk Presentations / www.learnaboutchicago.com provides public speaking and presentations about architecture and railroad history (see Page 4 of this website). In researching this display presentation about Hanna railway roundhouse; I came across a 2008 news story about another railway roundhouse in Biggar, Saskatchewan that Heritage Canada placed on its “Endangered Buildings” list. The story claimed that the roundhouse was slated to be demolished in 2009. Neither I, nor my client had heard about this roundhouse until now. It too is claiming to be the last standing roundhouse in western Canada. “Biggar”, population 2341, is the town’s actual name. Its motto is “New York is big, but we’re Biggar”! With the presentation being due this week, I needed an answer last weekend. I had just come from a friend’s presentation, showing the features of networking electronically through “LinkedIn”. In his third degree of contact, he had more than a million and a half contacts! He assured me that I had at least that many as well! This being a Friday night, I dutifully tore through those LinkedIn contacts, going down to the third, or fourth degree – nothing!! Municipal offices – even the town’s newspaper – were bound to be closed on Saturday. I pondered if there might be a local drug store that I could call on Saturday, and simply ask the clerk who answered if their roundhouse was still standing. Apparently, the Biggar Roundhouse is still standing, having been vacated last year by some sort of turkey farming operation. Roundhouses have been known to be put through all sorts of indignities during their life. An update on the Hanna Roundhouse: not only has it made the cut to the second round of voting in the Aviva Community Fund contest, but apparently Nickelback has posted a message of support for restoring the Hanna Roundhouse on their Facebook Fan Club website. Nickelback is from Hanna, and the roundhouse was featured prominently in their “Photograph” video. Parting ways can be very hard, especially for a car like my Mini. But it’s time. I need to let go of it and find someone new to give it some loving. 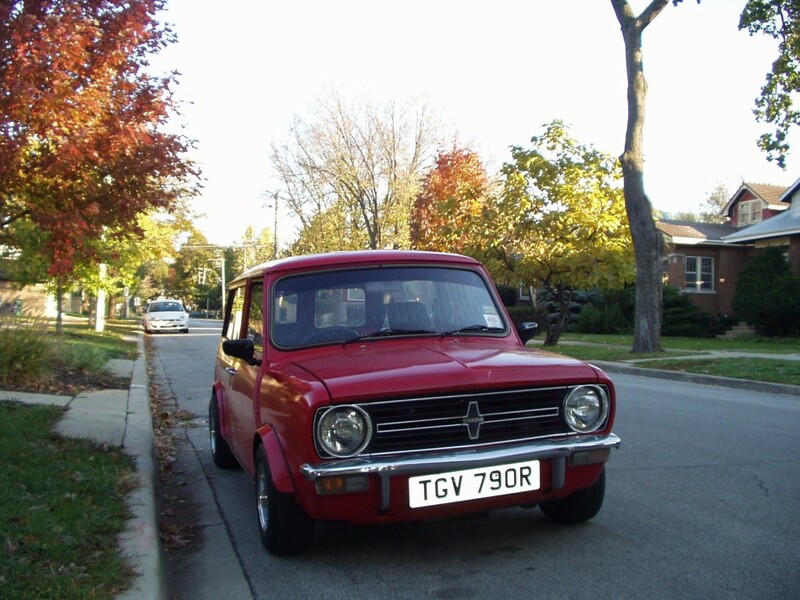 Affectionately kept, it’s a 1977 “R” registration (with British plates) Mini Clubman Estate. The serial badge says that it was made by Austin-Morris. It is driven from the proper side of the car, from the right hand side; and has a new muffler, motor mounts, shifter rebuild and paint. The carpeting is newer, it is highly presentable. The odometer reads 27,000 miles, probably true for the motor, which is a very strong runner. But it’s time. And breaking up is so hard to do. 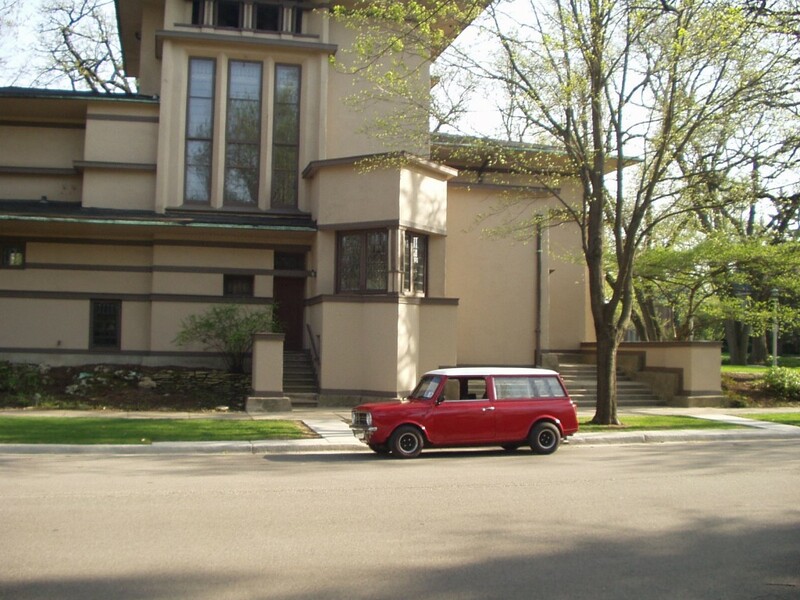 If you know of a good home for a 1977 Mini Clubman Estate – red, with a white roof, suitable for many sports teams including the Calgary Flames and the Calgary Stampeders, though friends have pointed out that a couple slight modifications would also make it suitable for the Montreal Canadiens – an excellent parade car, and a head turner where ever it goes, please contact me: info (at) babuk.com . It’s being offered at a highly reasonable price for a quick sale.